Coconut oil is one of the healthiest foods we can eat. It naturally supports thyroid health, contains anti-bacterial properties, boosts brain power, helps us lose weight, and slows down the aging process. I love coconut oil in my smoothies, stir fries, and soups. I also think my skin looks better, and I think more clearly, when I include a tablespoon or two in my diet each day. 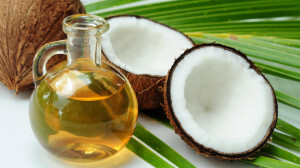 I also love coconut oil as an all-in-one skin cleanser and moisturizer. I keep a jar of organic coconut oil in the bathroom, apply the oil liberally to my face and body, and massage with an exfoliating cloth, for a few minutes before every shower. When I first started this practice, I had a hard time resisting the urge to wash the oil off with soap. Now that I’ve gotten used to it, however, I think my skin actually feels cleaner washed with oil, than it ever did with soap. My skin also looks much better than it did before, and I think it’s easier to use a single oil for cleansing and moisturizing, than to mess with the synthetic potions and lotions I was using before. Maybe that’s why yogis have used this ancient practice, known as abhyangha, for thousands of years! I’ve decided that a lemon a day, keeps the doctor away. Lemons are rich in antioxidants, such as vitamin C and ascorbic acid, as well as B vitamins and phytonutrients. An early morning glass of warm water and lemon juice can support digestion, liver function, and the immune system. When our liver is clear, digestion is healthy, and our immune system is strong, we feel better, and our skin is less likely to break out. It’s also good to know that lemon water can naturally whiten out teeth and improve our dental health. For those times that our skin breaks out anyway, a small amount of lemon juice, applied to a blemishes with a cotton ball, can expedite the healing process and reduce the appearance of acne scars. Whatever you do, don’t skip the guacamole! 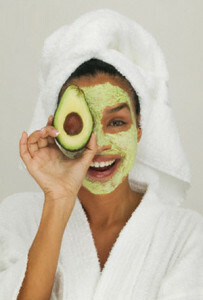 Avocados are one of the best foods for our brains, and our skin. A little each day makes our hair shine, gives us energy, and helps clear brain fog. Why? Because avocados are a great source of vitamins A, C, E, K, and B6, as well as potassium and healthy fats. I love avocado all by itself, but it’s also yummy added to smoothies, salads, and chili. Applied topically, avocado can also nourish dry skin. The iron, potassium, sodium, copper, and magnesium work synegistically to make our skin glow. When I was little, my mom kept an aloe plant in the house. Every time we had a cut, sunburn, or rash, she would break off a leaf, and squeeze the gel onto our wound. It healed our skin, without chemicals…and taught me a lifelong lesson about holistic healing. I still use aloe for these purposes today. Recently, however, I have also been taking daily aloe vera gel shots–1/4 cup straight up–to help heal my digestive system. I love it because it gives me energy, and is rich in amino acids and vitamins, including A, C, E, folic acid, choline, B1, B2, B3 (niacin), B6, and B12. If the shots seem too intense, try adding a little aloe to your water bottle, and sip on it throughout the day, as an alternative. Sea salt is an important part of a balanced diet, because it helps with electrolyte balance, alkalizes the body, and supports our adrenal glands. I sprinkle it on almost everything I cook. 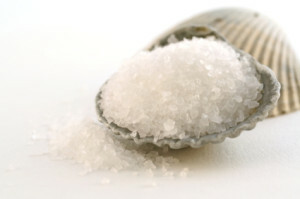 You might be surprised to learn, however, that sea salt can also nourish our skin, when we use it externally. In the bath, warm water and a cup of sea salt can help reduce inflammation and clear toxins from the skin. Adding a few drops of lavender oil to the mix can also help relax the mind and spirit. My favorite way to use sea salt, however, is as an exfoliating scrub, once or twice a week. I mix sea salt and almond oil in a glass jar, thick enough to make a paste, and massage it into my skin before showering. It’s best to rinse the scrub with warm water afterward (without soap), to retain the yummy fragrance and moisture left by the oil. Bananas are one of my favorite foods. They are inexpensive, easy to transport, energizing, and always make me feel better, especially when I have a migraine. Eating bananas can also help relieve upset stomachs, leg cramps, and dry eyes. What most people don’t know about bananas, though, is that they are also a great home remedy for dry hair and skin. Mashed up into a mask with a little honey, and worn for 20 minutes, bananas can refresh dry, frizzy hair, and restore moisture to the face. The more I learn about the power of real foods to heal my body, the more I accept that I don’t need chemicals, gimmicks, or deprivation to feel great. Although it does take a little time and patience to embrace the use of food as medicine, we ultimately find much greater peace of mind, when we nourish our bodies holistically, both inside and out. Amber Barry is a certified yoga instructor, wellness coach, motivational speaker, and blogger for My Crazy Healthy Life in Atlanta, GA. She found yoga in 1998, while recovering from a car crash that almost took her life. Little by little, yoga transformed her mind, body and spirit. It made everything seem possible, and she knew she had to spend the rest of her life teaching others how to get healthy through this beautiful practice. She earned her 200 hour certification through Peachtree Yoga Center and The Atlanta Yoga Fellowship in 2002, and has taught yoga and wellness ever since, at yoga studios, health clubs, non-profits, private homes, and local businesses. You can follow Amber’s adventures in wellness on the Facebook page for My Crazy Healthy Life, and at mycrazyhealthylife.com. I use all of these foods that you highlighted! I’ll be sure to check out your site too! Thanks for the tips! Christopher, I just saw your reply–sorry to be late in responding. I’m so glad to hear that you have discovered the healing powers of these foods! Please reach out if you have any questions about mycrazyhealthylife.com. Always happy to help in any way that I can.